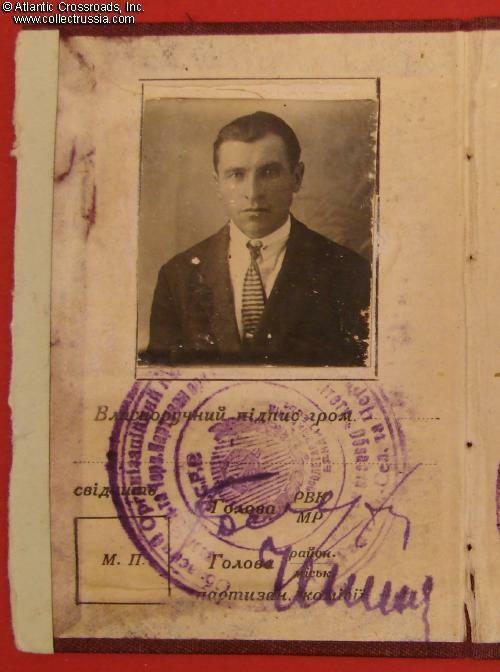 Photo ID of a Former Red Partisan, issued to Panelei Pankratov, circa early 1930s. Hard covered booklet, 2 ½" x 3 ¾ ". 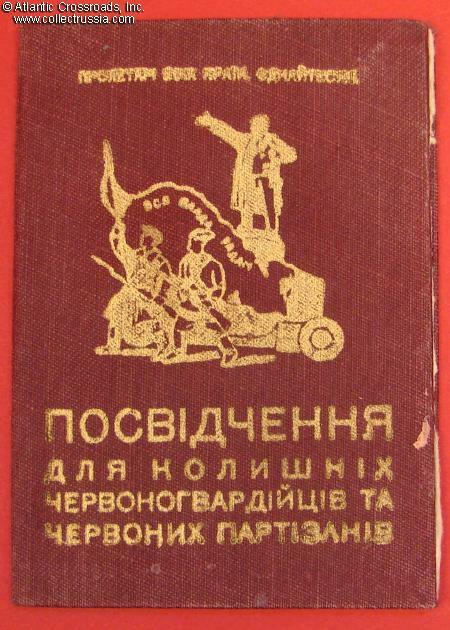 The maroon cover shows gold impression of Lenin standing on top of an armored car and armed workers. 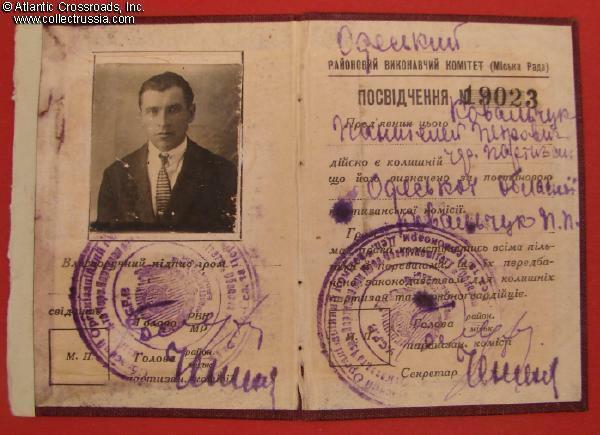 The text on the cover is in Ukrainian, "Certificate of a Former Red Guard or Red Partisan". 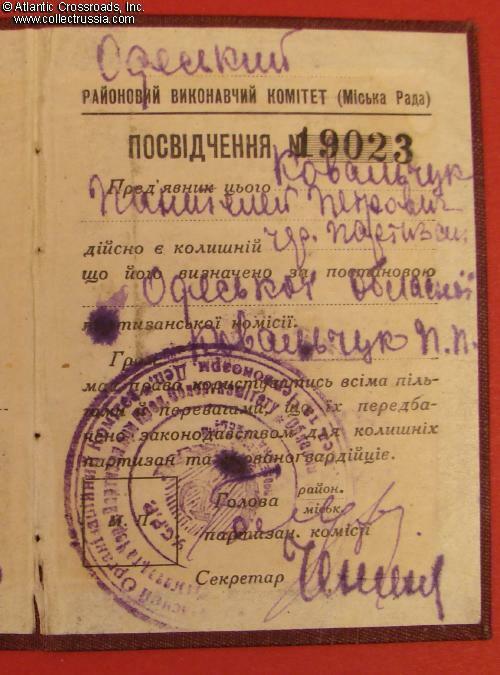 The document was issued by the Executive Committee (soviet) of Odessa Region in Ukraine. 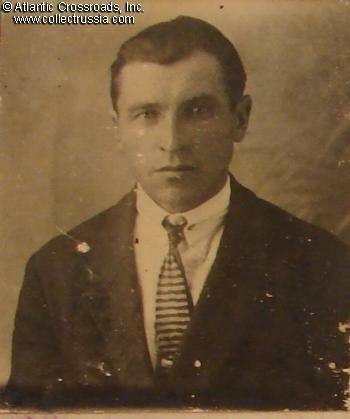 It includes a very nice photo of the recipient wearing a rather dapper modern suit and specifies that Pankratov was a Red Partisan (during the Civil War) and therefore given numerous special privileges. The document is in excellent condition, extremely uncommon for a document of this type and vintage. The cover is firm and bright, without fading or significant wear. The interior has a couple of small ink stains probably made by the clerk while filling out the document, no serious wear or damage. The text is fully legible. Like many documents of this type, the ID has a strip of green paper where it was apparently attached to an archival file.